If you're the kind of person who likes to constantly monitor your hardware's performance, you'd do well to give the free Perfgraph a try. 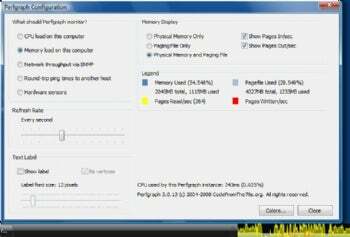 This simple tool runs in the taskbar, and monitors many different types of hardware performance, including CPU utilization, memory usage, CPU temperature, and more. Perfgraph is an excellent, free tool for monitoring your hardware. You may have to do a bit of configuration to get it working properly. At the end of the installation process, it asks whether you want it to run in your Taskbar. If you don't answer yes, you won't be able to use the program, so make sure to answer yes. Even once it's there, though, it may not seem of much use, because it's so small, you may not be able to see its graphs. You'll need to rearrange the taskbar. Right-click the taskbar, de-select "Lock the Taskbar," then drag the handle next to Perfgraph to the right--that way it will take up enough of the taskbar so that you can see the graphs. One more troubleshooting tip: If you don't see Perfgraph after installation, right-click the taskbar, and from the Toolbars menu, select Perfgraph. All this sounds like more work than it actually takes; you should have it up and running quickly. Note that you can only run one Perfgraph monitor at a time. So if you want to monitor both yoiur CPU and memory use, for example, you'll have to run two instances of it. To do that, right-click the taskbar, and select "New Perfgraph Instance." The utility is quite customizable; you can change the colors it uses, and details such as whether to monitor each CPU core individually, or instead as a single cumulative graph. To configure it, right-click it and select Pergraph Configuration. Perfgraph works much like other free programs of this type. It has a more compact interface than most, so for those who like to save screen real estate, it's a solid bet.